What’s the first thing you run out of when you’re serving up cocktails? For me, it’s not the gin (perish the thought! ), the Antica Formula, or even the fresh lemons. No, the Achilles heel to my party plans is always the ice. My smallish freezer has room for two ice-cube trays, and with a little planning I can usually sneak in enough plastic containers to make big chunks of ice. 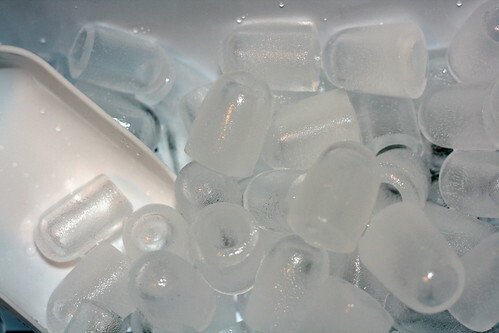 But if I’m going to be shaking up a lot of drinks or if more than a few people are coming over, then I always need more ice than I have. My downstairs neighbor (and co-author) Tony Hightower has graciously provided trays of ice, and I have resorted to picking up a bag of ice down the street at the 7-Eleven. However, this all changed when the folks at Air & Water got in touch and asked if I’d consider reviewing their NewAir AI-100SS countertop ice maker. Despite my not having too much countertop to spare – I have a small New York City apartment – I agreed, and they sent one to me so I could check it out. It’s fairly big as far as countertop appliances go, but isn’t huge – I fit it right in between my microwave and my fridge fairly easily. It’s simple to operate, too: fill it with tap water, turn it on, select a cube size, and it goes to work. The first cubes come out in six minutes or so, but they’re smallish and wet. It produces only a few cubes at a time, so if you’re looking to fill up a Boston shaker or even a Collins glass, it’s best if you wait a while. I had the best results when I could start the machine going several hours before my guests arrived, so it would have time to really fill up the ice receptacle. (I like the design – one neat feature is that the slotted bottom of the ice bin drains into the water tank, so any meltage gets captured and recycled into new cubes. And it keeps making ice until it either runs out of water, the ice bin is full, or you turn the machine off.) Once it’s filled up the ice bin, I tend to empty the bin into an ice bucket or put the ice in the freezer so the ice maker can make more. 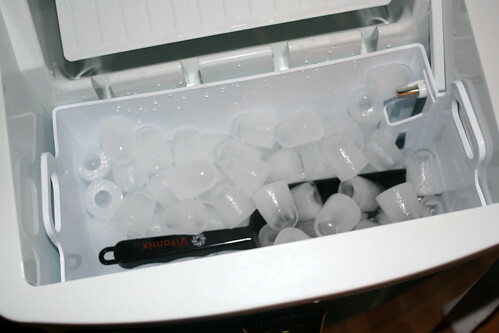 After the party, any water that’s left in the machine can be drained out a side port, and that’s pretty easy as well – I just tend to turn the ice maker sideways on the counter and place a plastic cup underneath the drain before I open it up. I cleaned it thoroughly when I received it, and have used it several times since. I notice a strong new-plastic smell when I open up the lid to get the ice or fill it with water, but that hasn’t affected the taste at all. The ice it makes is cup-shaped, with lots of surface area. It’s not a Kold-Draft, but then again it's a lot cheaper, smaller, and doesn't need a water line. The ice it produces is fairly warm as ice goes, and melts faster than big cubes or spheres -- it doesn't last long in the shaker, but is just fine for stirring or cooling drinks quickly -- but it is really nice to have a steady supply of ice available when I need more than my two measly plastic trays can provide. I see the hole in the middle and I was hoping they formed in layers and were clear. No such luck, I guess. They do form in layers, I think -- it lowers twelve very cold metal pipes into a tray of water, and the ice forms around them. Selecting the size basically just lets you specify how thick the ice should be before it turns off the refrigerant and kicks the ice off the pipes and dumps it into the bin. The first few batches of ice seem to be totally clear, and smaller cube sizes seem to be clear as well. But yeah, this stuff comes out cloudy and kind of brittle. They cool down pretty well if you put them in the freezer after they come out of the ice maker, as long as you keep them from sticking together too much. I recently bought this ice maker a few months ago and I’ve hosted a few small parties since then. It’s worked great for me, especially when I put the ice in the freezer after it’s been made.